And Another Thing...: Feeling Lucky? 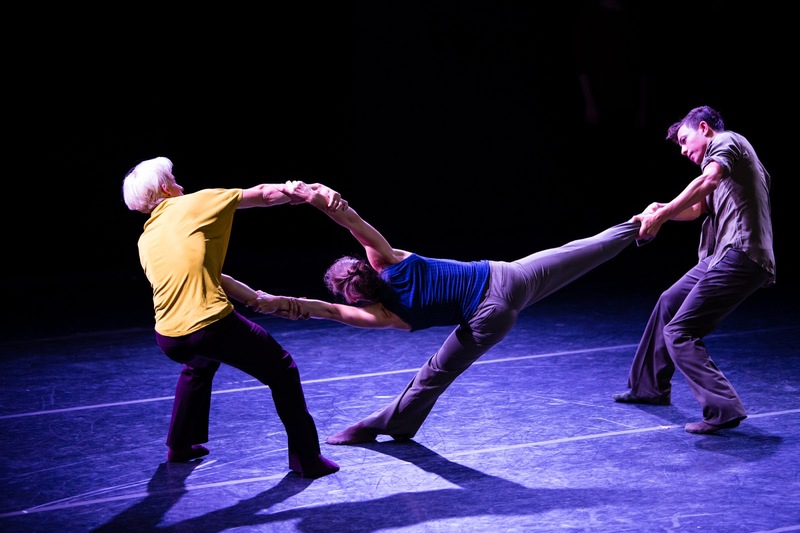 Whim W'Him dancers Justin Reiter, Lara Seefeldt and Jim Kent in Ihsan Rustem's "The Road to Here"
That’s the joy of live performing arts. 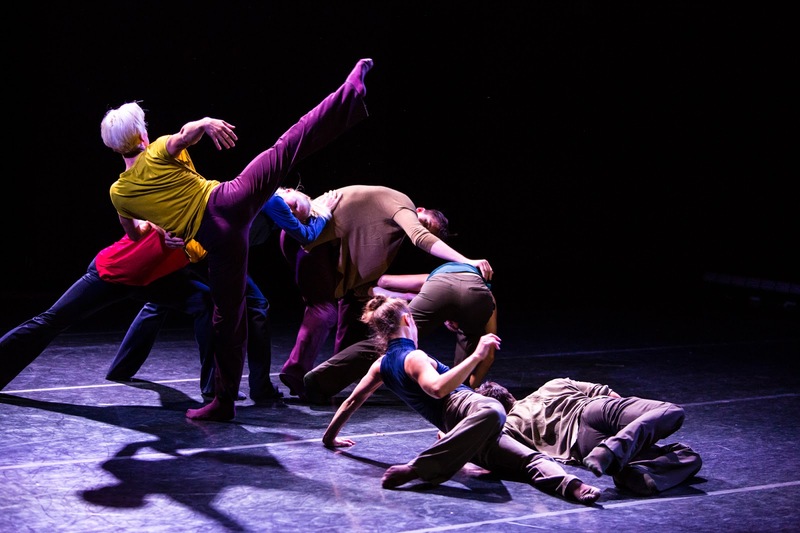 The seven company dancers, with a little guidance from Artistic Director Olivier Wevers, chose the three dance makers from more than 95 applicants. And the dances that showed up on the evening’s bill couldn’t have been more different. in Joshua Peugh's "Short Acts on the Heartstrings"
Joshua Peugh’s show opener, “Short Acts on the Heartstrings” was a slight but engaging bit of whimsy. The rumination on love and relationships, set to a medley of mainly mid-20th century pop ballads, was as light as the sea foam green chiffon dresses the three female dancers wore with their tan ankle socks. Light, sweet fun. San Francisco-based choreographer Maurya Kerr’s offering, by contrast, was dark and brooding. 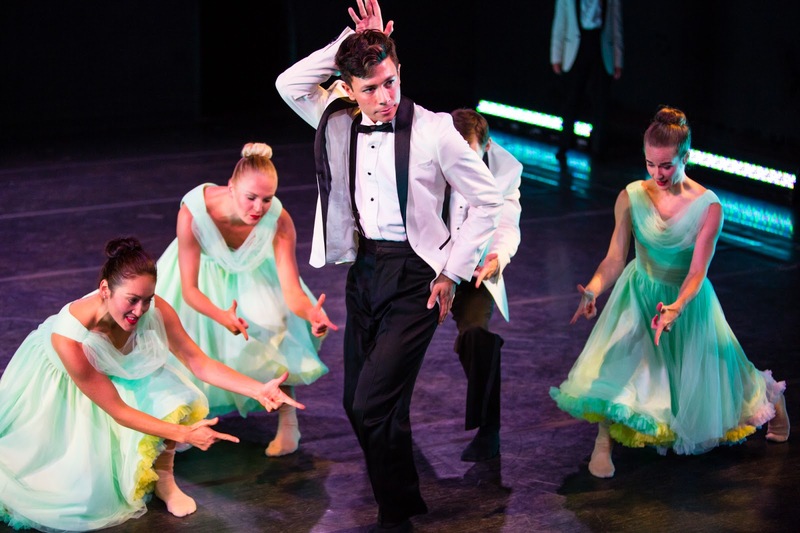 Set on six of Whim W’Him’s seven dancers, “into the wide welcome” centered on a duet performed by Tory Peil and Kyle Johnson. Peil’s long, elegant limbs twitched and spasmed, a portrait of a creature who longs for human contact but whose body seemingly reacts against it. “wide welcome” had its moments, but in the end, it just felt a little murky. Lyrical and physically demanding at the same time, this short gem has it all: strong performances by the entire company, inventive choreography, a touch of humor, but most of all, “The Road to Here” has an emotional resonance that sits with you long after the lights come up and the audience files out. Whim W'Him company members in Rustem's "The Road to Here"
I know, I know, I’m gushing a little bit. But (bear with me), I was thinking about the tuning fork that my third-grade music teacher had. She’d tap it, the metal would vibrate and produce a set of harmonic tones, and then she’d bring that fork close to our 8-year old bodies. You could feel the sound inside you. That’s how Rustem’s dance affected me. I could feel what he had to say through the choreography he created. Normally I find the insertion of text into a dance a little off-putting. Either it’s too obscure (or I’m too linear) to figure out why the text is there. Or else, it seems like the artist is trying to bludgeon me with a MESSAGE. When a man starts speaking in the middle of the melodic score in Rustem’s dance, though, I was all ears. I can’t remember his exact words, but they melded seamlessly with the dancers’ movements. What that man had to say resonated with me the way Miss McNelly’s tuning fork did all those years ago. In an epigraph printed in the program, Rustem quotes Alan Watts. “Choice is the act of hestitation that we make before making a decision.” Leap into the unknown, take a risk, this dance shows us. And that’s what we do every time we experience art. We buy our tickets hoping the investment will be worth it. In the case of Ishan Rustem’s “The Road to Here,” my gamble paid off big time. 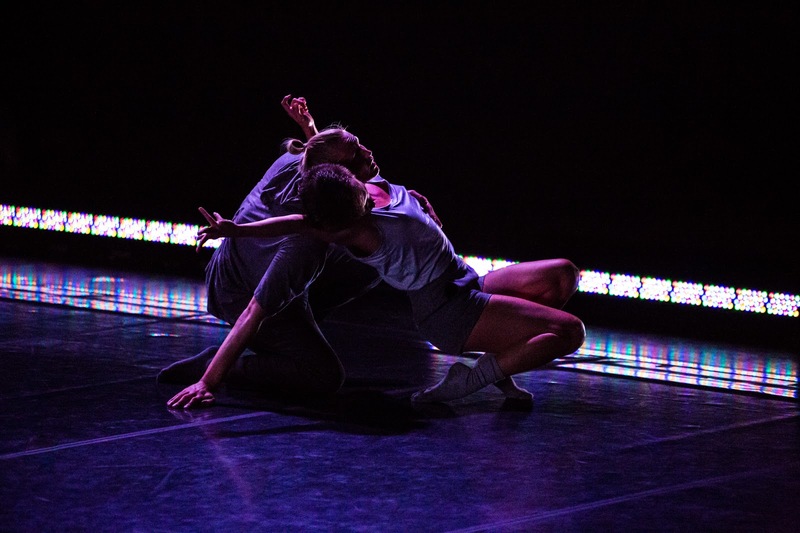 You can catch Whim W’Him’s “Choreographic Shindig” Wednesday through Saturday, September 16-19, at the Erickson Theater on Capitol Hill in Seattle.